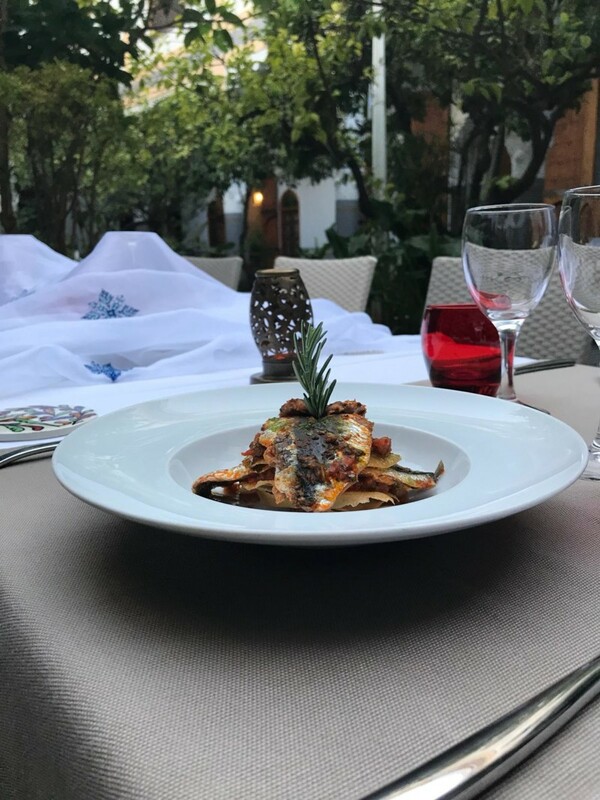 Lightly fried sardines layered with the traditional ‘leaves’ of wafer thin pastry might sound like a strange combination, but the Sardine Chermoula ‘Mille feuilles’ (a million leaves as the traditional dessert is called in French) is a savoury take on a classic dessert. And it is absolutely delicious! Crispy layers of a type of pastry that is used for making dishes such as pastilla*in traditional Fassi cuisine, a splotch of smoky aubergine dip and sardine fillets marinated in chermoula**: heaven on a plate if you ask me, and available from today at Eden, the courtyard restaurant at Palais Amani. Just inside the medina in Fez, Palais Amani’s great cedar doors open onto an unexpected enchanting garden. 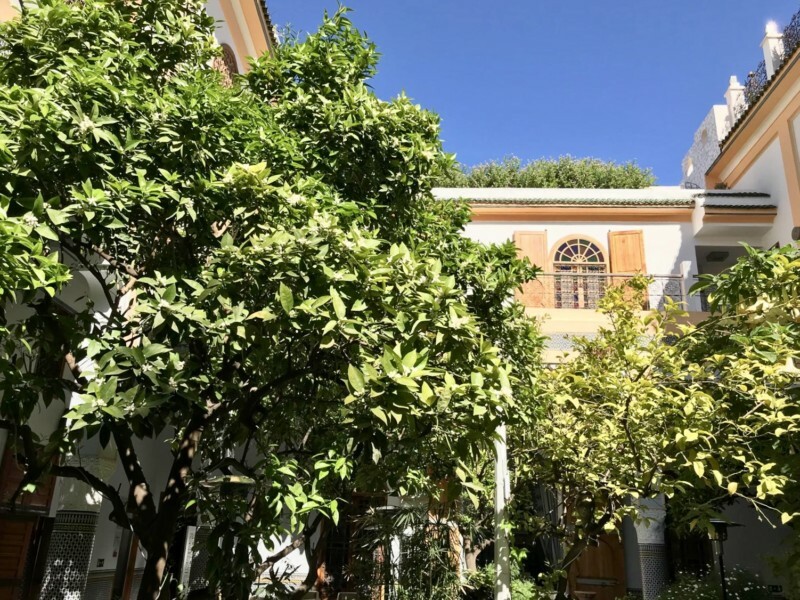 Blue and white mosaics, mature citrus trees that at this time of the year are in blossom, and a gracious central fountain sets the scene for a perfect spot to dine. And this dish is just one of the delights that the new spring Market Moroccan menu offers at Eden, the reputed restaurant at Palais Amani. For all you chefs out there, you will soon be able to learn to make this dish during a new series of Modern Moroccan cuisine workshops that Fez Cooking School will be showcasing later on in the year, but for now why not drop by and enjoy the Market Moroccan Menu in Eden’s gardens. *Pastilla is a celebratory dish made of either pigeon or chicken, eggs, almonds, and wrapped in thin layers of crisp pastry. ** Chermoula is a marinade made from coriander, garlic, freshly ground paprika, lemon juice and olive oil.